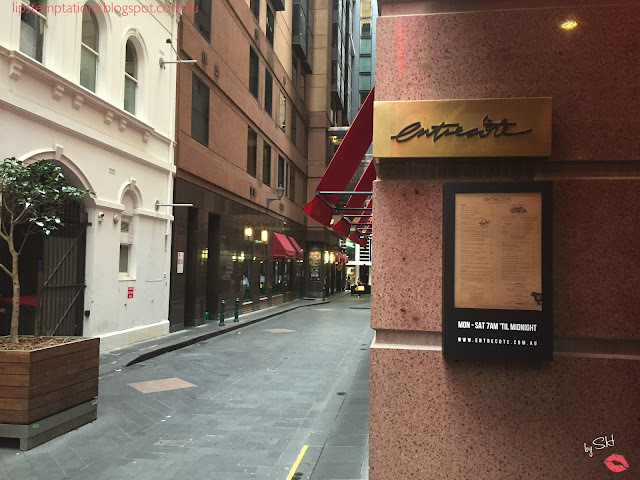 Entrecote originally open at South yarra by Jason M Jones and Executive Chef Jason Rodwell (ex Watersedge, Albert Street Food& Wine, Aubergine). 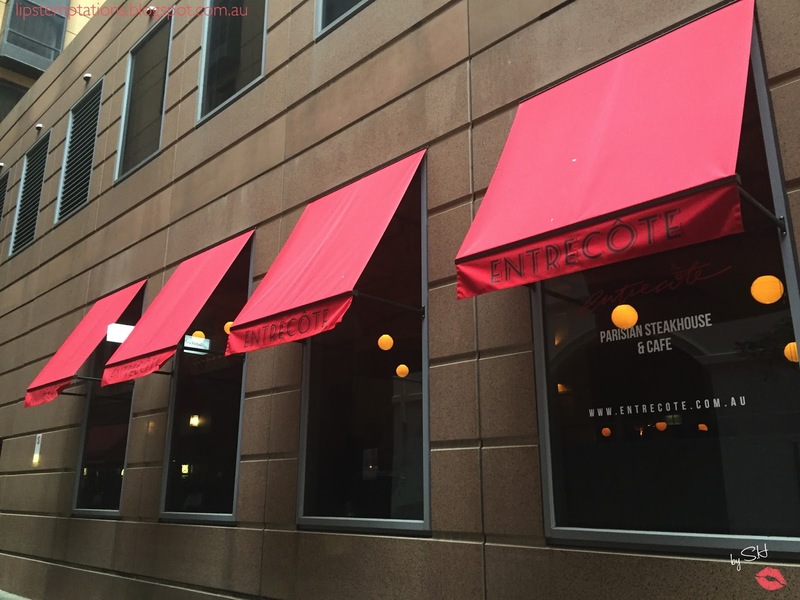 Entrecote CBD opened approximately four months a go, fit in perfectly in the Parisian area of the city. 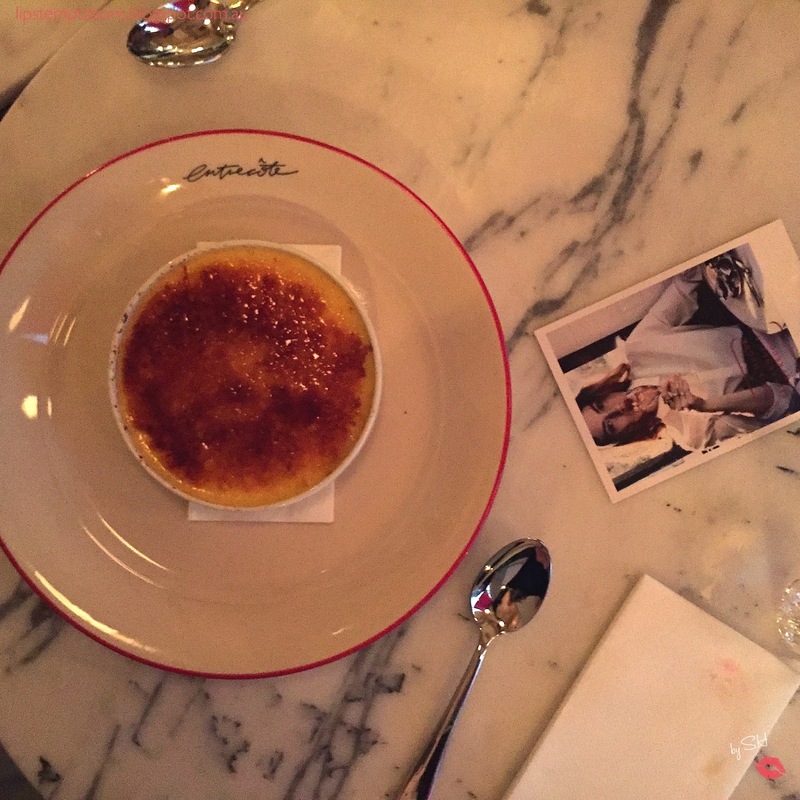 The venue prior Prix Fixe has been renovated and transformed into a modern, classic and chic Parisian place. 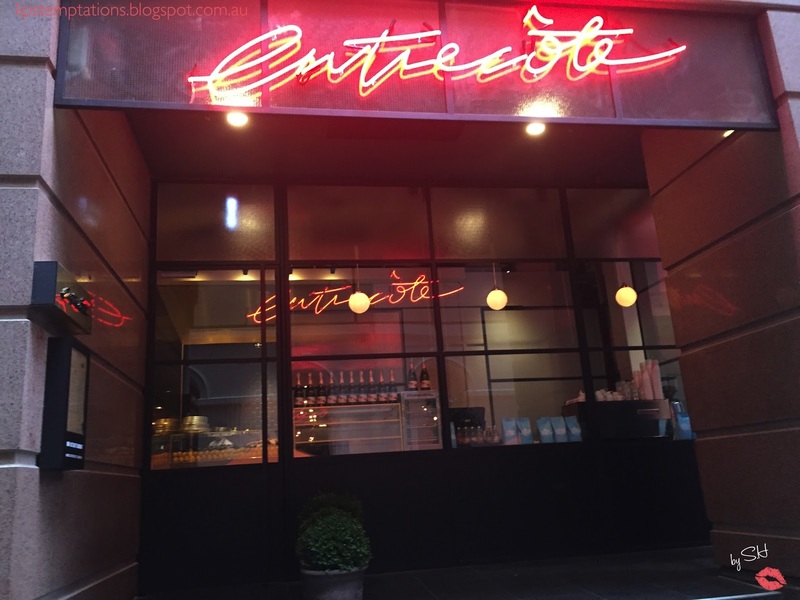 Entrecote is noticeable with the red signage and bold neon lighting, that's definitely in trend this year. 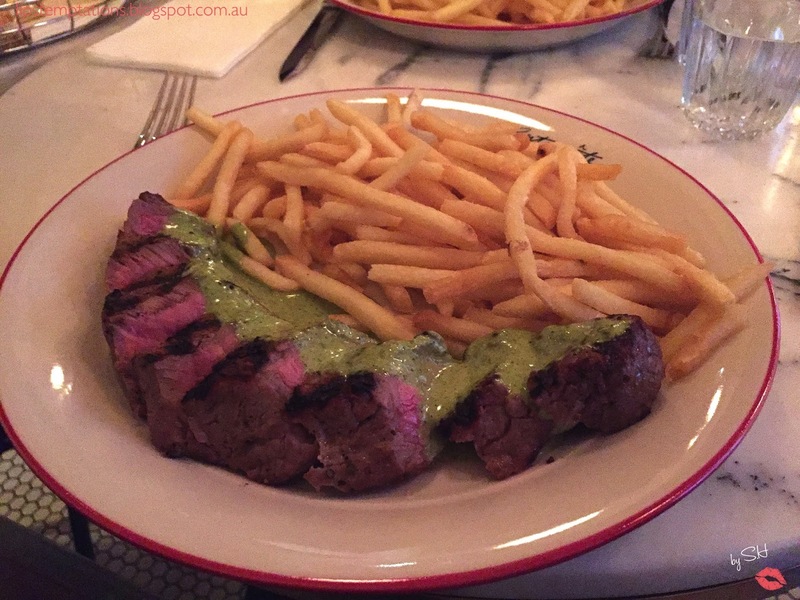 Entrecote serving breakfast from Mon-Fri 7am-3pm and they start serving their famous steak frites at 11.30am. They do accept bookings for breakfast, lunch and dinner but for dinner there is a minimum of 6 people. There is also an outdoor kiosk equipped with an open kitchen and coffee machines for a quick take away coffee. 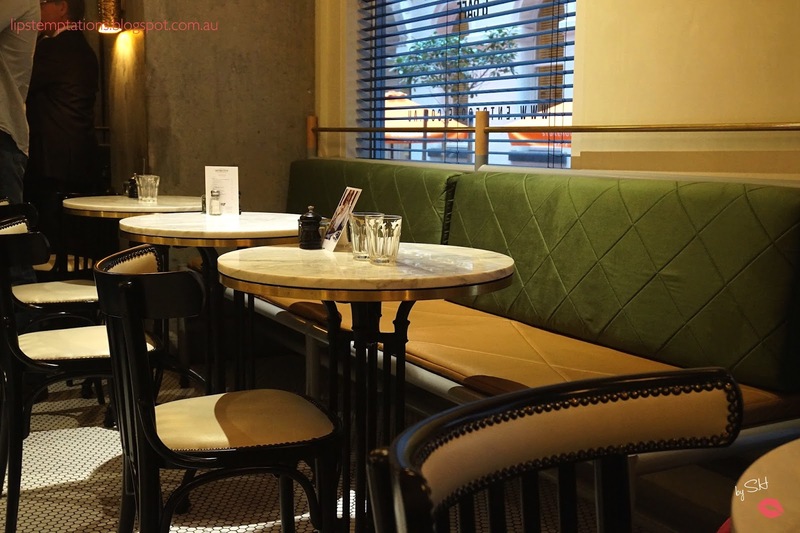 The place it self fits around 70 people and definitely able to accommodate a large group of people such as birthday or corporate after work drinks. 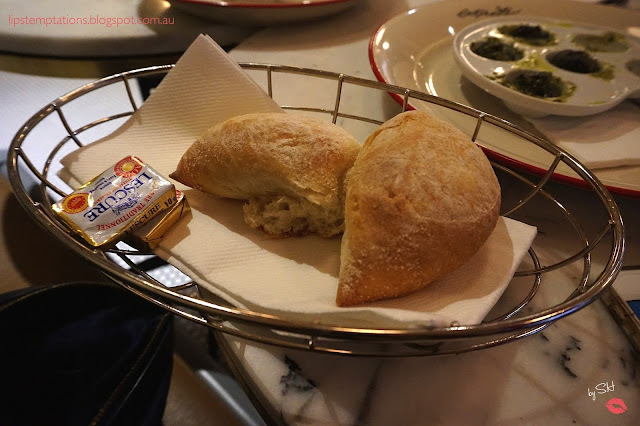 They served classic Parisian breakfast such croissants, tarts and baguettes but the most popular is their croque-monsieur - grandmother, ham, three cheeses, thyme bechamel ($16.9) or make it a madame ($18.9). 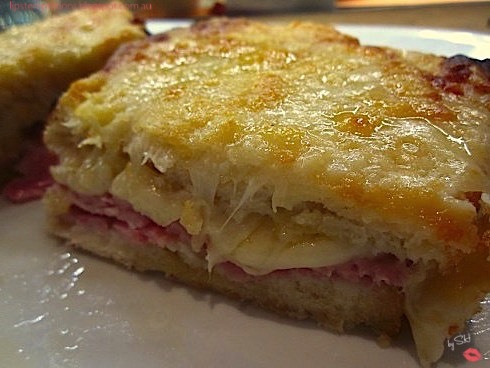 The croque-monsieur was well made, the ham and cheese layered careful and all the ingredients works really well together. 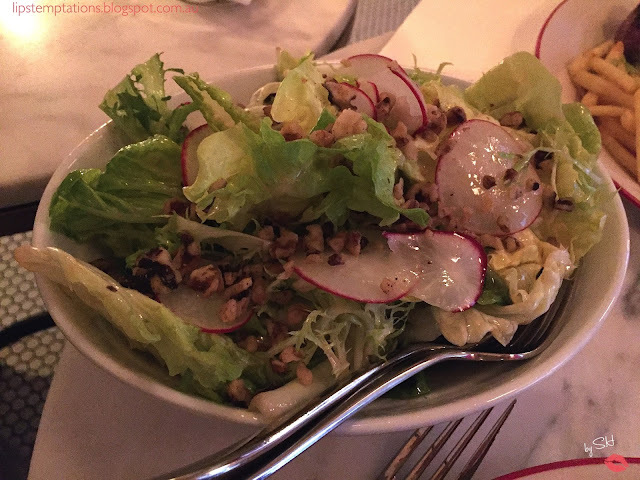 I love French food and I have been to French a couple of times since I still have some family in Europe and I'm always eager to find a delicious French meal. 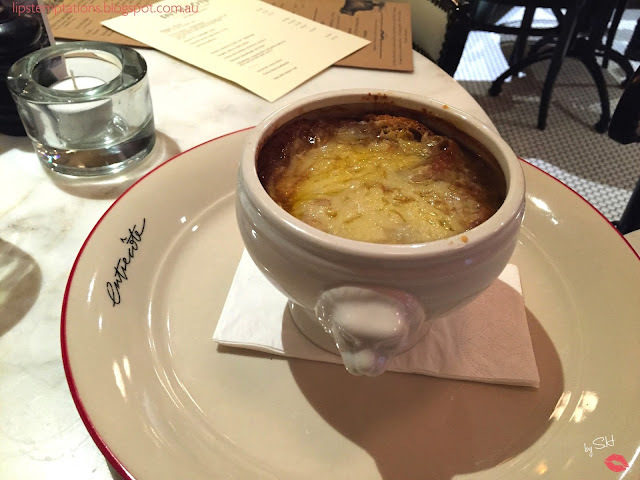 I decided to try Onion Soup Gratinee, Gruyere crouton ($17.9). Onion soup has been popular since the 18th century and it's a classic French dish. They served it with bread and butter and I love the French bread. The soup served hot with the melted cheese on top and it was rich, very filling and I'm not sure I'm able to finished it alone. Escargot, baked in garlic & herb butter ($16.9). 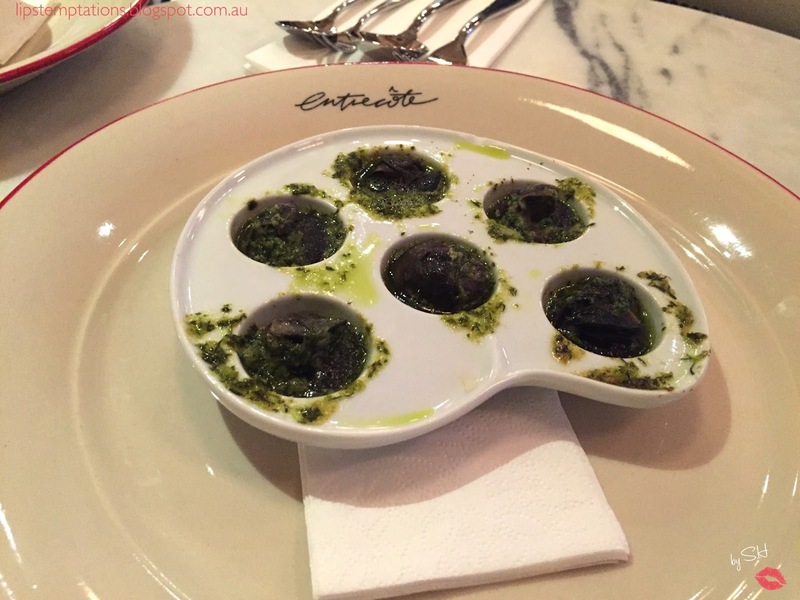 Escargot is one of my favourite dish and it's enough to attract me to a restaurant so it's a mandatory for me to try Entrecote version of it. 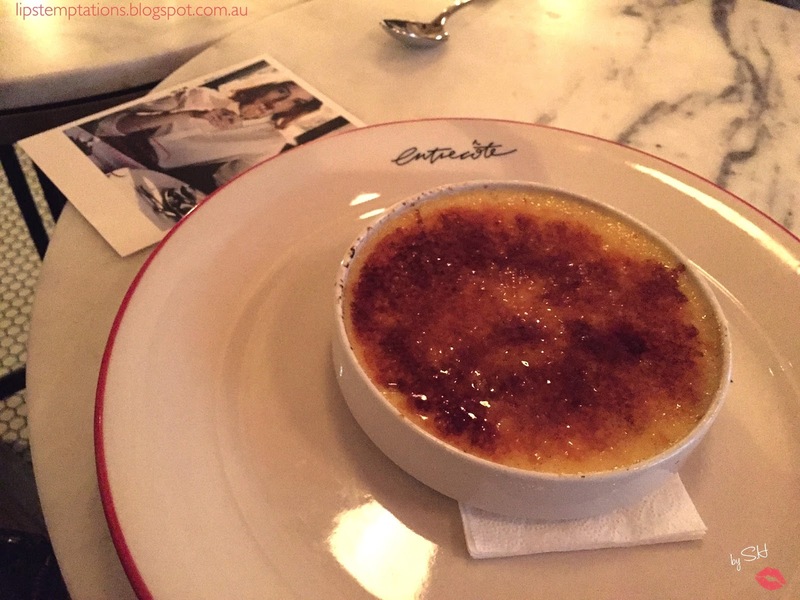 Creme Brulee Traditionelle ($16.9) was delicious. It was sweet but not overly sweet, creamy, smooth with the crunchy burnt sugar on top. Overall it was good meal and good value for money. 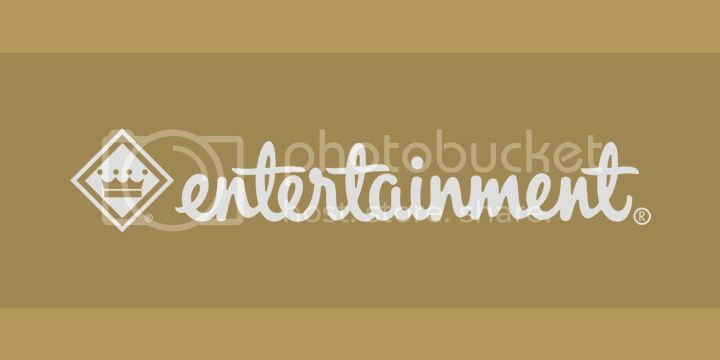 If you own 2016-2017 Entertainment book than you will have 25% discount, up to $40. 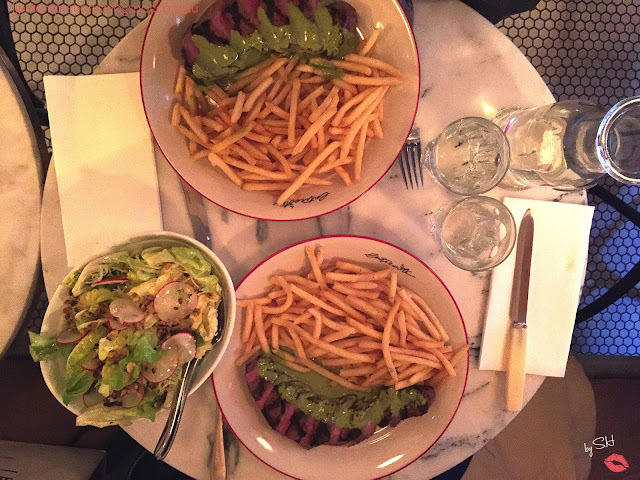 Hey, Entrecote is such a brilliant place. I really like their services. 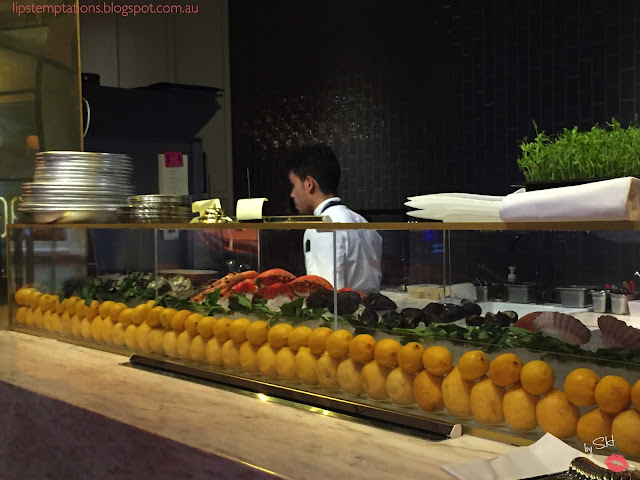 The food served over there is so delicious that no one can resist visiting there again. It is one of my favorite Chicago venues where I love to party a lot with my friends.